This downstairs studio is beautifully appointed, close to the beach, Mount shops and restaurants, Zespri and Blake Park. Built in 2017 the studio is modern, functional and offers an exceptional place to relax and recharge. It's ideal for a couple or single person who is looking for a modern base to stay while exploring the area. It's also an ideal alternative to a hotel if working at one of the nearby businesses, like Zespri, Ballance or The Port. The studio has its own entrance, separate from the owner's residence upstairs. It is fully insulated and warm and in the afternoon the sun streams in. 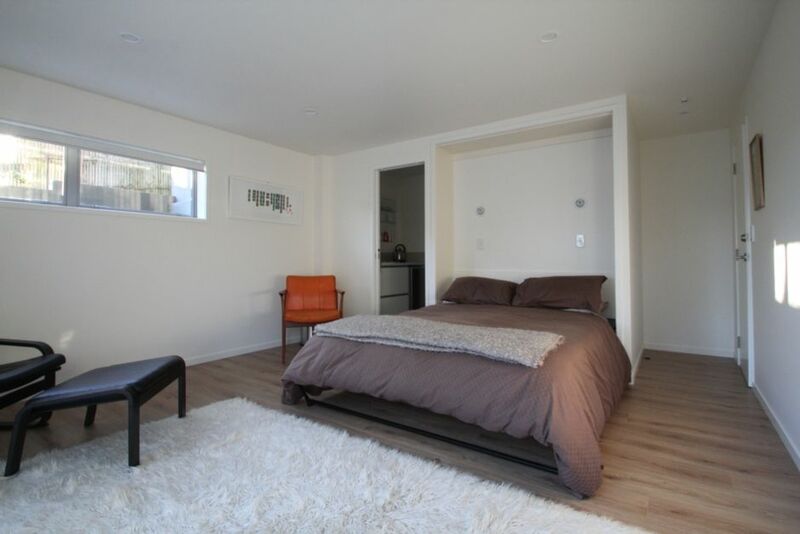 It features a luxurious Queen bed from which you can watch the wall mounted TV. Alternatively you can snuggle up in bed reading a book using the individual down lights. Original artwork adorns the walls of the main studio for your enjoyment. Adjoining the main room is a large vanity room that has a deep sink, larger mirror and most importantly an extra-large bar fridge to keep the champagne or beer cold. A kettle, glasses and cups and tea and coffee making facilities are provided. There are no cooking facilities, however, the Mount's best cafes, bars and restaurants are only a short walk or drive away for you to enjoy, and there's always delivery. After your swim at the hot pools down the road or the beach a few blocks away an extra large shower awaits you. Quality linen, soap, shampoo and conditioner are provided for your use too. The property is situated on a quiet street and off street parking, right next to the studio, is available to guests. We have spent extended time living and travelling overseas. We love to return the hospitality that we received and sharing their knowledge of the local area. We live upstairs and are usually available in the evenings and weekends. We love interacting with our guests and look forward to welcoming you to our special place in the Mount soon. There's only one main rule - please treat this place as your own. - The studio is not suitable for children, but if you have a young baby then please let us know as we may be able to accommodate you. - Please wash any sand off before going into the studio. We enjoyed staying here. Room was very clean, bed comfy and we had everything we wanted. Was very handy to cafe and to the Mount. We will be back. Thanks for everything. Fabulous studio. Central to the Mount. Modern and clean. Comfortable pillows. Nice and quiet. but perfect for us as I love the quiet for sleeping. This property is very close to the beach or a walk up the road, you are in town. The accommodation is quiet and private. It is well resourced with clean material, and was very clean. A short stroll brings you to all sporting events held at Blake Park. I could not fault this Mount property. Situated beneath the owners house I would not have known they were home. Comfortable bed. Cosy. Lovely kitchenette and huge shower. Immaculate Studio at the Mount. I highly recommend this immaculate, warm studio that is so handy to the Mount. Duncan and Deborah are friendly hosts who are very obliging if needed. The bed is so comfortable it’s hard to get up and the shower is divine! Although it doesn’t have its own cooking facilities there is a well stocked cupboard of cooking utensils. Ideal for a single traveller or couple. Thanks for staying with us - it was great to have you and glad the weather played its part!